Any time an investor invests in a product or investment vehicle and they are not guaranteed a return, the investment falls under the category of “risky”. There are investors who only invest if they are guaranteed a rate of return. They are investing without risk but also without hope of significant financial growth. Treasury bills and certificates of deposit offer small interest rates but they are guaranteed to increase the principal investment slightly over time. But most people who consider themselves “investors’’ do engage in risk in investing, and some are very aggressive about their risk tolerance. It can be difficult for advisors to fully grasp an investor’s risk tolerance, unless the investor is steadfast in his approach. But, in conversations with the investor, it is possible to determine where the balance is between willingness to risk principal versus the potential rate of return desired. Risk tolerance and rate of return are a significant topic in Spectrem’s wealth segmentation series study Financial Behaviors and the Investor’s Mindset. The study approaches investors from both angles, questioning their risk tolerance then asking what they expect in terms of rate of return on their investment. Among Spectrem’s Millionaires - investors with a net worth between $1 million and $5 million - risk tolerance is strongly set at “moderate” or “conservative”, with 76 percent of investors self-defining in one of those categories (60 percent listed themselves as “moderate”). Conservative investors do not risk any investment funds, while moderate investors placed a limited portion of their investments in products that assume some risk. But the Spectrem study also looks at Millionaires segmented by age, and discovered that younger investors are much more likely to be aggressive investors. A full 50 percent of Millennial Millionaires self-defined as either “aggressive’’ or “most aggressive”, and that includes 11 percent who placed themselves in the “most aggressive” category, in which they are willing to place all of their investments in products and services that do not guarantee a rate of return and can cause the investor to lose his or her principal investment while offering the chance at a significant return on investment. The question to ask investors is what their investment goals are and how that aligns with their risk tolerance. Are aggressive investors able to withstand losses that can occur with risky investments? And, on the other hand, are conservative investors going to be able to reach their financial goals without taking an investment risk? 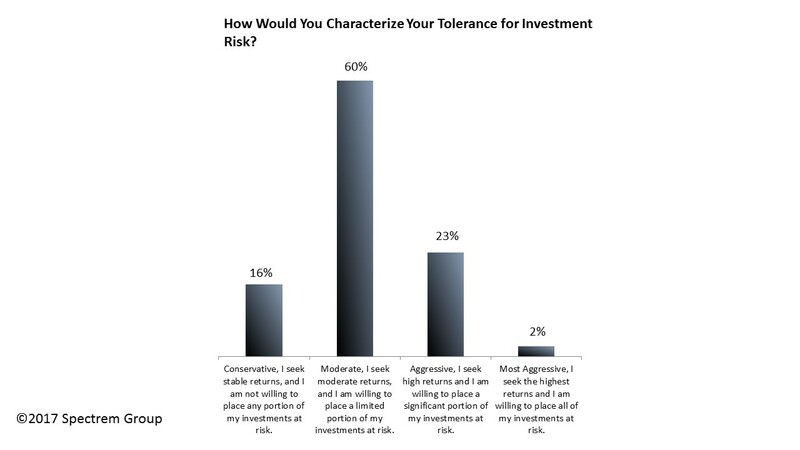 Among six investment selection factors offered in the study, the overwhelmingly most popular choice was “level of risk associated with investments”, selected by 87 percent of Millionaires. If that is the first factor determining whether to make an investment, advisors need to know how their investor clients will react to the risk level attached to particular products. It is probably a sliding scale, but every investor is different and will react differently to any investment product involving a risk factor. While a majority of investors are unwilling to risk a large portion of their investment funds in order to gain a greater rate of return, they still expect return on their investment. In some cases, they expect more in return than is feasible based on the risk they take. The Millionaires in the Spectrem study were asked what will provide a significant boost in the future to their current wealth position, and 59 percent said “better returns in the future from investments”. However, without greater risk, it is unlikely investment will provide “better returns” in the future. This is a matter of balance, and advisors need to know how investors align themselves. They also need to be aware of the reality of the situation, that conservative investment strategy is safe but is not significantly lucrative. At the same time, investors who are willing to take significant risks must be aware just what they are risking and how much they are willing to lose.